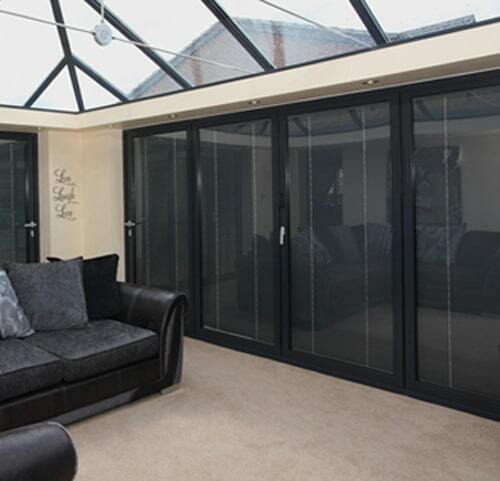 One of the great benefits with bifolding doors is the large glass panels and how much light they can let in. If you’re looking to add bifolding doors to your home or are building a new extension, quite likely you’ll be desiring a folding door. Your new bifolding doors may be on an elevation that gets the sun all day long. Your garden may also be overlooked by other houses. Therefore there are situations where you may need to consider privacy and shade for your new bifold doors. Integral blinds are one solution. Integral blinds are fitted between the glass in your bifolding doors and windows. You’ll already be familiar with horizontal slatted blinds that lift and lower and with adjustable slats. Integral blinds are the same, but they are housed within the glass of your doors. Typically made from powder coated aluminium they are designed to be discreet, long lasting and are quite a new innovation in blinds for the home. But they also have many other benefits as well. Integral blinds will never need cleaning. Because integral blinds are permanently sealed within the double glazed unit, this means they’ll never need cleaning. Unlike conventional blinds positioned in front of the window, they won’t get dusty or dirty. This is a huge benefit to a product that has in the past been quite hard to keep clean and dust free. Another great feature is that when all your windows and doors are open on a sunny day, they won’t get blown about by draughts. Integral blinds let you enjoy your bifolding doors more. As the blinds are housed within the glass and not over your doors, you can enjoy the colour, slim lines and detailing of your doors at all times. Even when all the blinds are closed you can still get a great view of your new doors. These innovative Integral blinds become part of your doors and integrate seamlessly within them. A choice of manual or automatic operation. Integral blinds are available with several opening options. You can choose blinds that operate manually with a magnet. On the one side is a sliding magnet that raises and lowers the blind. On the other side of your door is another similar magnet that tilts the slats as required. Magnet operation is great because there are no cords hanging from the doors (although cord options are available as well). The magnets are colour coated the same as your blinds or your doors making them discreet. There are several automatic openings options with integral blinds as well. These can be push button operated, remote hand held operation, solar controlled and even programmable. You can choose to have your blinds instantly raise at a set time in the morning and close in the evening. This is great in the winter when you want your blinds closed if you’re still out of the home. All the automatic options are simple to install and easy to use. Integral blinds can enhance the performance of your doors. The extra layer of blinds within your double glazed units can also enhance their thermal performance. This can make your glass units and your doors as a whole far more thermally efficient, saving you even more on your heating bills. A wide colour choice on integral blinds. Our complete range of integral glass blinds is available in a wide choice of colours, styles and options. You can choose to colour match your blinds to your aluminium bifolding doors or choose a contrasting colour. Both your new doors and your new blinds benefit from durable powder coating that is available in metallic colours, gloss, satin or matt as well as standard white, grey or black. What else should you know about integral blinds? We’ve given you all the benefits of integral blinds, but there are other considerations as well. It’s important to know that should you choose integral blinds, they’re part of your glass unit and not a separate entity. Therefore if theres an accident and your glass or blinds are damaged, both the glass and the integral blind will need to be replaced. One cannot be repaired without the other. This is mainly due to the hermetic sealing of the blind within the glass. As with any type of product, quality is key. Basfords only provide the leading quality blinds on the market. There are cheaper alternatives out there but with such a sophisticated product, quality is essential. Only with a quality blind can you have peace of mind that they’ll work reliably and smoothly for many years to come. Even if you already have existing bifolding doors in the home and are thinking about integral blinds, talk to us. It’s possible to replace the glass on your existing doors (and even your windows) with the latest technology in privacy and shade. They can also be fitted with windows, screens and french doors. Contact your local door and glass experts. Basfords have provided quality folding doors enhanced with integral blinds to many delighted homeowners in the area. You have our guarantee of the best bifolds fitted with the highest quality blinds. Contact us for further information.